Not to be confused with Scottish Gaelic language or Scottish English. Scots, which is sometimes incorrectly called Scottish English, is a West Germanic language, very similar to English, that is spoken in Scotland. A spin-off, Ulster Scots can be found in the north of Ireland. It is quite different from the Scottish Gaelic language, which is a Celtic language. There have been disagreements about the linguistic, historical and social status of Scots. Focused broad Scots is at one end of a scale, with Scottish Standard English at the other. Scots is generally regarded as one of the ancient varieties of English, yet it has its own distinct variations. Northumbrian Old English was established in what is now southeastern Scotland as far as the River Forth by the seventh century. The region was part of the Anglo-Saxon kingdom of Northumbria. Early Scots began to diverge from Northumbrian English in the twelfth and thirteenth century. There was immigration of Scandinavian-influenced Middle English-speakers from the North and Midlands of England. Later influences on the development of Scots were from Romance languages via ecclesiastical and legal Latin, Norman and later Parisian French due to the Auld Alliance as well as Dutch and Middle Low German influences due to trade and immigration from the Low Countries. Scots also includes loan words resulting from contact with Gaelic. From the thirteenth century Early Scots spread further into Scotland through the burghs established by King David I. The growth in prestige of Early Scots in the fourteenth century, and the decline of French in Scotland, made Scots the prestige dialect of most of eastern Scotland. From 1610 to the 1690s during the Plantation of Ulster large numbers of Scots-speaking Lowlanders, some 200,000, settled there. In the core areas of Scots settlement, Scots outnumbered English settlers by five or six to one. 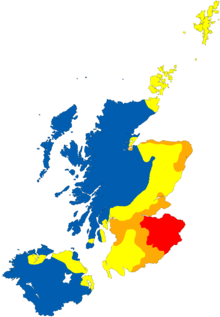 Southern Modern English was adopted as the literary language after 1700, while "Modern Scots" is sometimes used to describe the spoken language after 1700. ↑ [Iain Máté] (1996) Scots Language. A report on the Scots language research carried out by the General Register Office for Scotland in 1996, Edinburgh: General Register Office (Scotland). ↑ The Scottish Government. "Public attitudes towards the Scots language". Retrieved 3 January 2010. ↑ Gregg R.J. 1972. The Scotch-Irish dialect boundaries in Ulster. In Wakelin M.F. Patterns in the folk speech of the British Isles. London.